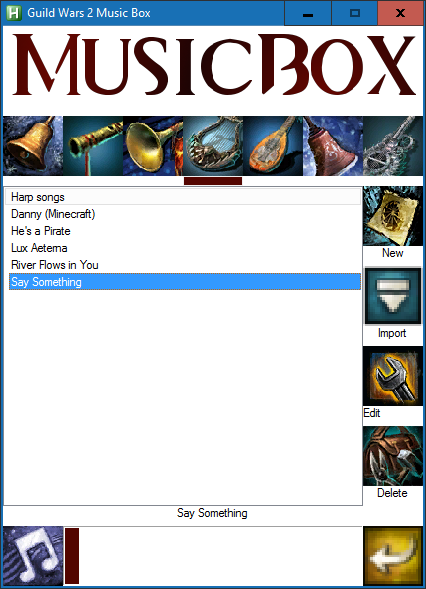 gw2mb.com • View topic - Music Box Unofficial App (Macro Player/Manager)! Music Box Unofficial App (Macro Player/Manager)! Re: Music Box Unofficial App (Macro Player/Manager)! So, after looking in the settings ini and changing the gw2-x64.exe to just gw2.exe as that is what I'm running. I'm not able to play any of the music. I wonder if key's are just not set up right for me, (I have them as Num1, num2, num3, etc in game). It shows the progress bar but sadly no action from the client side. EDIT : I should also note that I'm not seeing the AHK icon in my notification area like I normally would when AHK is active. Bojangles wrote: So, after looking in the settings ini and changing the gw2-x64.exe to just gw2.exe as that is what I'm running. I'm not able to play any of the music. I wonder if key's are just not set up right for me, (I have them as Num1, num2, num3, etc in game). Strange, the program sends numpad keystrokes so that wouldn't be the problem. It might be worth double checking your GW2 process name in the task manager. I'm trying to use your application as well but it doesn't seem to work either any idea what might be the issue with it? I have also setup the keys in numpad and I have also imported a song from a website to play. It plays via the application ( I see the bar move) but nothing happens ingame..
Yeah, I'm still having the issue. Checked to ensure proper process was in the config. This is a great utility. I added the ability to send a chat message while a song is playing. Play madalin stunt cars 2 and more car games for free on PC. it really works you have to run it as admin. I would love to use this application. with many great utilities.